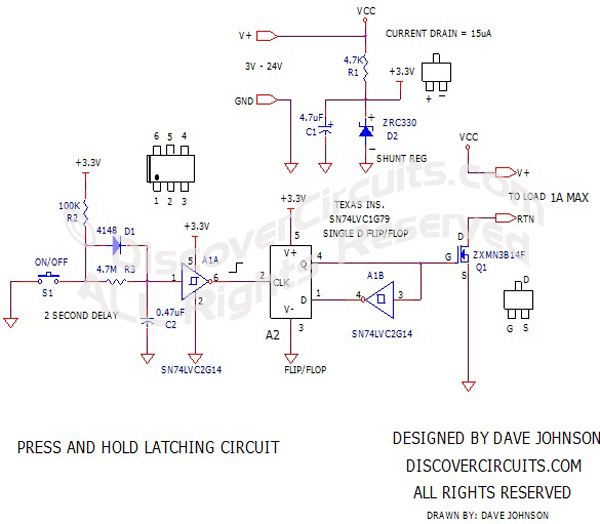 A Discover Circuits visitor needed a latch circuit which could operate using a power supply voltage ranging from 3v to 24v. He wanted to use a tiny pushbutton switch to turn on and off power to a load. However, he wanted a 2 second delay between the switch activation and the state change of the output. The delay would prevent accidental activation of the circuit from a quick push button switch closure. The circuit below performs this function. A dual Schmitt trigger inverter IC and a single flip/flop IC form the heart of the circuit. The A1A section performs the 2 second delay function. The Q output of the flip/flop is inverted by the A1B inverter section and fed to the flip/flop’s data input. This configuration forms a data type flip/flop which changes state with each leading edge pulse from the A1A inverter. The transistor chosen should be able to handle about an Amp of current. I used a 3.3v shunt type voltage regulator, which draws about 15ua of current from the supply voltage to limit the voltage fed to the circuit to 3.3v but the circuit can operate fine from a 3v supply. In fact, the latch circuit will operate below 1v but at such a low voltage the Q1 transistor will not fully turn on. If the supply voltage is limited to 5v, the shunt regulator is not needed and the circuit will operate while drawing a very low current of about 1ua.